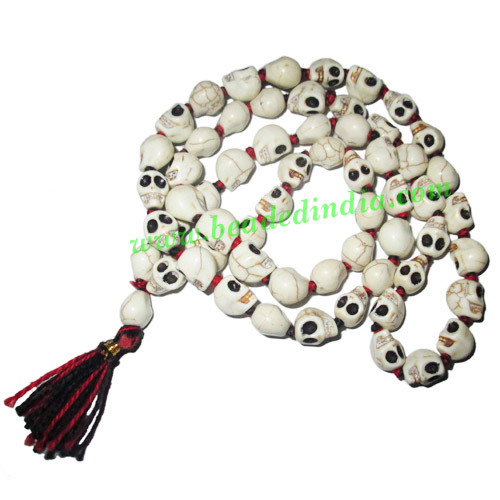 Skull (narmund, nurmund) beads string (mala), size: 12-14mm., weight of a string (mala) is approx 100 grams. One string (mala) has approx 54+1 beads, used for chanting, meditation and mantra siddhi etc. Silver Plated Brushed Beads, size: 26x11mm, weight: 7.45 grams. Leather Cords 1.0mm (one mm) round, regular color - magenta. Copper Brushed Beads, size: 35x15x5.5mm, weight: 5.08 grams. Flat Suede Leather Cords 4.0mm, Color - Rusty Red.